For the first year after your braces have been removed, you will be wearing your removable retainer 24 hours a day. Your orthodontist can determine during which activities you should remove your retainer, such as eating and participating in sports. Do not wear your removable retainer when swimming or when you are in any water activities at the beach, pool, lake, or ocean. 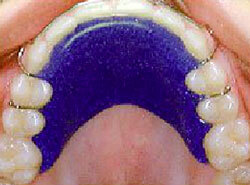 A dislodged retainer can become a choking hazard. Put the retainer in it’s case during such activities. Since your teeth can still shift years after orthodontic treatment, it is vital to consistently wear your retainer. The retention phase can often last for more than one year. Speak with your orthodontist to see how long you should wear your retainer for your individual case. Your retainer is bonded from canine to canine. Carelessness can separate this bond. If left unbonded, even for only a few days, tooth decay can occur and the unattached tooth can become crooked. So if you feel a loose bond with your tongue or see a tooth get out of line, call us for an appointment immediately (a charge will most likely be made for a repair or replacement, so do be careful, please). Even though the retainer feels secure and the teeth remain aligned, we want to continue to examine the bonded teeth, retainer and your bite based on the schedule given to you on your retainer agreement. 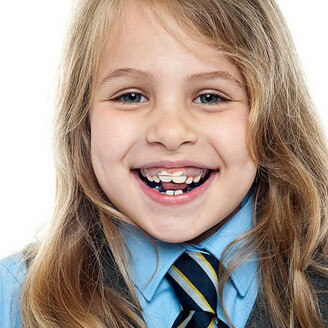 Teeth with fixed retainers require a little extra attention. Please do not eat anything hard or sticky as this may dislodge the bonded retainer. To clean your retainer, rinse it with water once you remove it from your mouth. Brush your retainer with toothpaste and don't forget to brush the roof of your mouth as well. 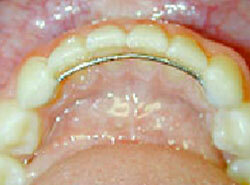 If you are instructed to wear your retainer only at night, please keep the retainer in a cup of water during the day. You are given a special case for your retainer- please make sure to keep it in the case when not wearing it! It's important to keep your removable retainer away from heat, so the appliance will not become distorted - NEVER BOIL IT! Also, make sure to keep it away from pets, so it does not become their new chew toy. You can brush your teeth and gums as usual, but flossing has to be done more carefully. 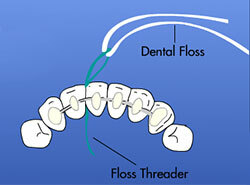 Because the bar or flexible wire is in the way, you cannot bring the floss down between the teeth in the usual manner. If you can thread your floss from the front under the reatiner wire, fine; otherwise, you will have to use a floss threader or special Super Floss (available in our office). 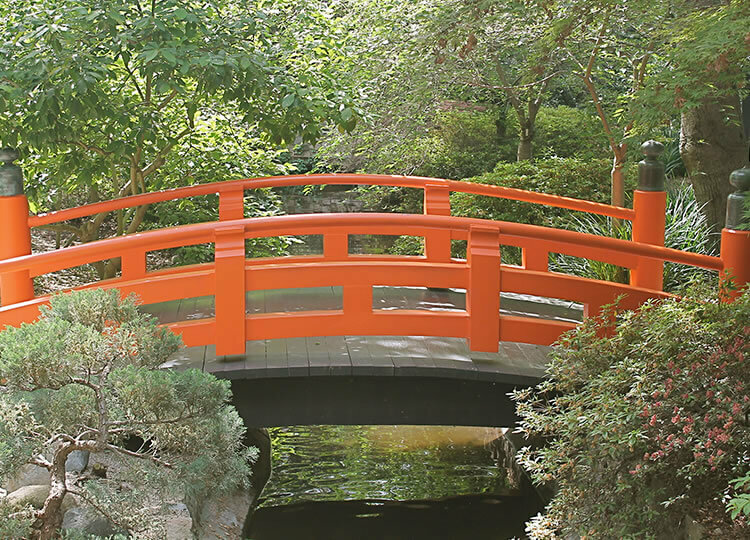 If you have difficulty, please call us. Be sure to tell the dentist or dental hygienist who regularly cleans your teeth to be ever so careful of your new retainer.